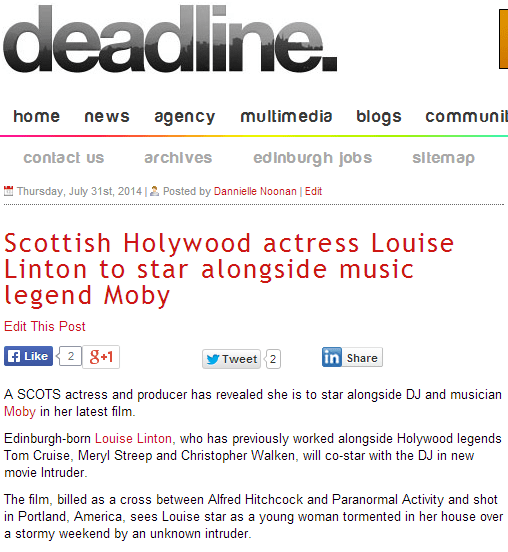 H ERE at Holyrood PR we love celebrating success with our clients, so we were understandably chuffed when news went viral that Louise Linton is to star in a movie with music legend Moby. 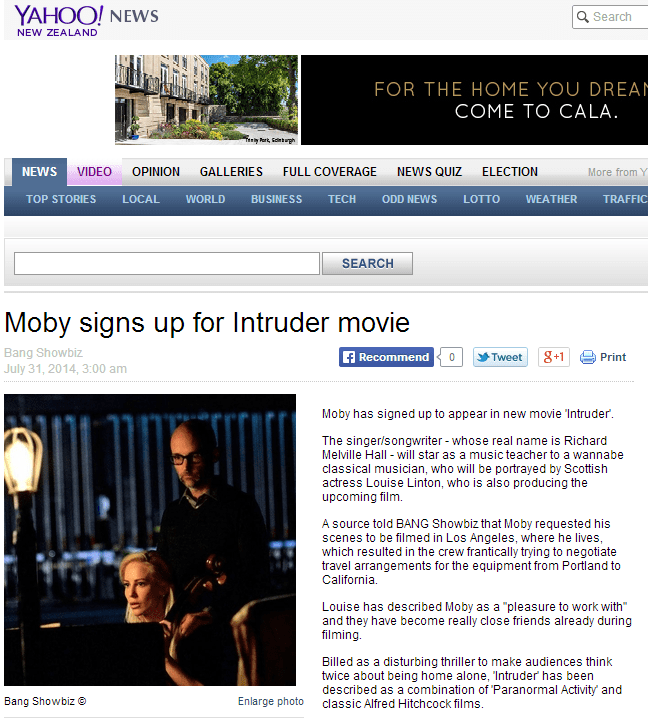 As part of a phased PR campaign (led by Holyrood rising star Ross Stebbing), we released the announcement that her upcoming movie Intruder – a home invasion thriller from writer and director, Travis Zariwny – will feature the renowned DJ and producer Moby in a prominent role. By targeting our key contacts at respected publications, gossip columns and entertainment news desks, we ensured the news landed in front of the right eyes and the efforts were rewarded as the story was picked up by more than 20 influential online movie news sites. Intruder sees Linton playing a young woman who is psychologically tormented in her home over a stormy weekend without the knowledge that there is a stranger in her house. Her character, Elizabeth, is a cellist in the Portland Philharmonic, and Moby plays her foreboding and somewhat ominous mentor and music teacher in the symphony. The media buzz means the blonde actress’s name is on everyone’s lips and each piece of coverage included important key messages about Louise and her burgeoning Hollywood career. We’re a show and tell PR agency who are so proud of our storytelling and writing skills that we put every media release on our website – as well as the results it generates. Proving our Scottish PR agency really is telling stories to the whole world, the Louise Linton and Moby story surfaced on Yahoo NZ. Yahoo is one of the original search engines and it continues to reign as one of the most popular sites in the world, with roughly 700 million visitors every month. The New Zealand version of the website is a portal of news and entertainment information for 4.433 million Kiwis. That means the story will raise awareness of Louise Linton in the southern hemisphere and increase the anticipation for Intruder’s cinema debut. Between Louise’s high profile lifestyle in America, Holyrood PR’s award winning PR activity in Scotland, and Yahoo’s reach in New Zealand, the Fettes educated actress is storming the world. The celebrity story also featured on The List. This trusted entertainment website is a bible for music lovers, movie goers and anyone interested in the entertainment industry, meaning Louise will gain recognition from her target audience. With more than 60,000 readers a month, this means a huge amount of people who follow or work in the film-making industry have read the story. That is particularly valuable to Louise, sindce the story prominently reported that her own production company, Stormchaser films, was instrumental in getting the movie made and bringing Moby on board. The List website is one of the largest events and entertainment sites in the UK, with an audience of 1.75 million unique users (October 2013). Originating in Scotland as a fortnightly magazine, The List is now a digital favourite and has become the ultimate guide to what’s on in the UK. It promotes new talent considered to be on the road to success. Fuelled by original internet and service providers Microsoft, msn.com featured the story in their ‘Star News’ section, proving Louise really is set to shine. Launched in 1995, msn goes hand in hand with the range of services Microsoft provides, such as Hotmail and Messenger. it is also a hugely popular news source for the countless millions of people around the world who used Microsoft’s Internet Explorer web browser All of which means Louise’s latest announcement was guaranteed a massive online audience. MSN snapped up the news that music man Moby has taken to the silver screen and introduced Louise as his fellow actor, earning her a gold star in the movie world. 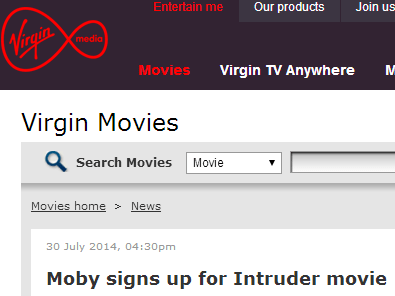 Virgin Media is a hub of star spangled movie news, featuring trailers and clips along with entertainment headlines. It is also the first ‘quadruple play’ media company in the UK offering television, internet, mobile phone and fixed-line telephone services. In other words, Virgin Media is a bona fide heavyweight in the digital world, with hundreds of thousands of users following its online celebrity news. 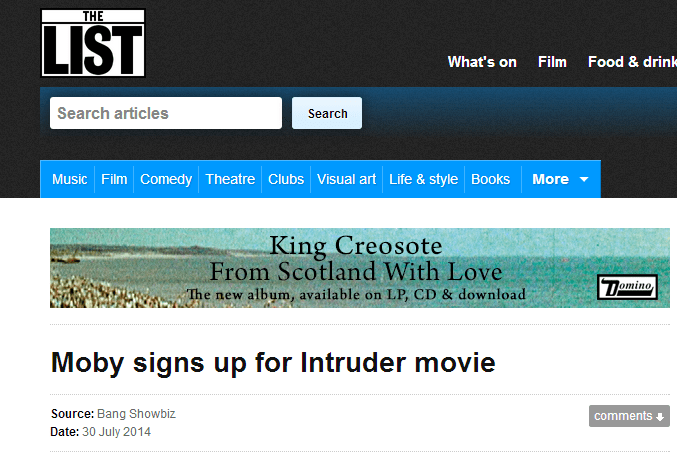 The site publicised the news that Louise will star as the lead in the psychological thriller Intruder, with Moby playing her cello instructor. And it explained how Louise’s character is a musician who is tortured in her own house when she is home alone during a story night. The online coverage is another PR win for Holyrood PR and is bound to prove great publicity for Louise. With 3459 Facebook ‘Likes’, Female First is a popular site for women and men alike. Featuring celebrity gossip, lifestyle, fashion and beauty and entertainment news, the site is an online glossy magazine for women with an interest in popular culture. By featuring the story about Louise Linto, it has ensured the Edinburgh born actress joins A-listers like Kendall Jenner and Katy Perry who feature regularly on its pages. The Female First piece mentions Louise’s role in producing the movie with her production company Stormchaser films, as well as including quotes from her and background information about her previous acting roles. As a fearless female with brains as well as beauty, coverage on this website could create potential business leads for endorsement deals – do we smell a Louise Linton fragrance to go along with her handbag collection? Edinburgh-based agency Deadline News featured the news as one of its Top Stories, meaning Louise got maximum exposure on the website which attracts more than 30,000 unique visitors every month. With more than 500 Facebook Likes and 3000 Twitter followers, Deadline News also shared the story widely via social media, further amplifying the reach. Louise was very much the star of the Deadline story, which recounted her previous acting work with other big names in Hollywood such as Tom Cruise and Meryl Streep. Deadline also credit Louise for her brains as well as her obvious beauty, explaining that she has degrees in journalism and law under her belt, and is heavily involved with some charities. Not only do our clients appreciate that transparency, they also love the service we provide by giving each client an online PR hub dedicated to them – with all of their media releases, the best of their media coverage and image and video galleries (not to mention links to their own website and their contact details).